Robertos located at Club Playa Real brings the flavours of Napoli to Marbella. Our menu offers Pizzas, Pastas and traditional Italian Fish and Meat Dishes The following entertainment schedule is offered. Children very welcome! Sunday – Happy Hour on all drinks 6.30pm-7.30pm. Take away menus available and Kids menu available every evening. 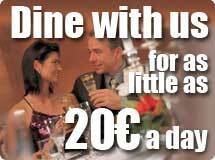 All take away menus orders over 30 euros will receive a Free bottle of wine. Our light and luxurious well established Club House offers a fully extensive a la carte menu and snack menus and also offers the following entertainment evenings. Children very welcome! During the summer months the Pool bar at Matchroom Country Club is open six days a week where light snacks and refreshments can be enjoyed over looking the magnificent Mijas Golf Course and beautiful Gardens.